As I've been reporting in recent entries, I've been working with a symbolic logic course which has been using various exotic symbols including double struck P (ℙ). Since every Unicode point seems to have its own story, I thought I would report some of the ineresting challenges for this character. When you are discussing a topic with lots of different symbols, you soon realize that in terms of Unicode, they will come from multiple blocks. For instance double struck P is from the Letter Like Symbols block (starts at U+2100), while other math symbols may be in Arrows block, the Number Forms block, the Mathematical Operators Block or possibly the Dingbats Block. You can see from the Unicode Org Symbols and Punctuation Chart just how many blocks are involved. 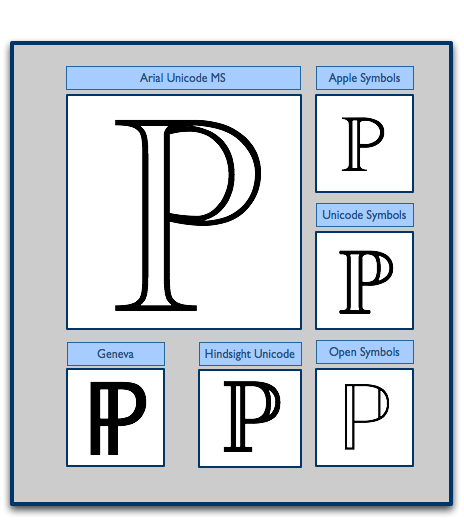 Although a user doesn't normally have to know the Unicode point value, because many insertion tools such as the Windows Character Map, Mac Character Pallete or others are organized primarily by block, you do have to sort of have an idea of how blocks work. Fonts with a robust set of math symbols are still pretty rare, and sometimes the letter like symbols are even rarer. At one point I had ℙ (P) pulling from one font and ℚ (Q) from another...interesting. Below are some fonts I know have doublestruck letters like ℙ,ℚ. Normally I try to avoid font and size specifications, but double struck P is an interesting counterexample. One challenge is that because the legs are hollowed out, it has a much lighter visual appearance than say normal P. My base text is 12 px on the Web, but for the double struck P, I decided to bump up the size to about 16 px (in a standards-compliant way of 1.3 em). The other issue was selecting font faces. I wanted one with thick double legs - if you look at the font chart below from my Mac, you'll see that some fonts had some very skinny legs. Math symbols can stretch the boundaries of Unicode display technology, but not as much as some other related blocks like Letterlike Symbols the home of such symbols as ℙ (double struck P, see image below), ℚ (double struck Q), and even the pharmacy prescription symbol (℞). Double struck letters in particular are used in different branches of mathematics to respresent, for instance, the set of all real numbers (double struck R) or in symbolic logic to symbolize any atomic proposition. See the table below for different double struck letters and their Unicode values. See the Penn State Math Symbol chart for other common letter like symbols of math.